MY sister from Switzerland has been visiting over here since the middle of July. She rode out from town with Cindy on Sunday afternoon and has been enjoying her visit. She had been staying at my brothers and had the use of a car for the first part of her visit, so she has been hither and yon all this time. But only once out here. When we were younger and first found out we had siblings we were not raised with, she came over to the US with another sister who was raised separately from all the rest of us. 5 siblings raised in three places, just for the record. Anyway, when Brigette was her at the age of 19, she fell in love with the life her and stayed for a year, until the government forced her to return home. She has been back a couple times in the remaining years up to now, but only fort short visits. This is her third time and she wanted to re-live her youth when she would ride with me and go along and help with the work I do. Of course, just like all of us she has aged, so riding a horse was something that was not as easy as when she was 19. So I put her on Beaver and he of course took good care of her, as he does everyone. She helped me move some cows yesterday and enjoyed it. Then Fr Tyler came to visit. He had been gone to Spain for World Youth day and we hadn’t seen him for several weeks. We all sat around the fire last night, waiting for it to burn down to coals so we could grill some steak. Fr Tyler brought some cigars and we sat and smoked and relaxed and enjoyed the company until the food was ready then ate a meal of home grown steak, home made bread and cucumbers and onions in vinegar. The wall tent I had ordered arrived yesterday afternoon, so all pitched in and we got it up, tho’ not quite as I had planned as I didn’t have enough long poles, as I had thought. But it is up and will protect people from the elements who want to stay in it. An internet friend from Nevada, who has been working over in this neck of the woods, stopped in yesterday morning. I put him to work. Made him ride a good horse and help me move some cows, bring in a bummed calf and rope and doctor a yearling heifer. We had fun. Fed him a fresh burritto and pico for dinner and shishkabobs for supper. My sister from Switzerland has been in this country visiting , so Cindy brought her home with her yesterday afternoon. She and I rode this morning and it started to rain so we came in and just putted around this afternoon. Cindy has been making up a batch of bread for the upcoming cow work, so she made a fresh batch of dough this evening and fried some up and we had Indian Taco’s. Mmmm! Got another friend flying in to spend a week, from California. We met over the internet also, on the same chat board as the first guest. There should be quite a few from the Ranch Country board meeting up at Devil’s Tower this Sunday for the annual poetry event. It starts at 1 pm at the picnic area below the tower. and goes until about 4. I enjoy visitors. Especially if they are as nice as these guys! Hooked up the mower today and knocked down some weeds around the corrals and out in the hog pasture. Tried to cut some american licorice plants, but the ground was too uneven. Gonna have to rig a hydraulic cylinder to raise and lower the cutting bar I guess. Then I worked on some corrals and after dinner I had some visitors. then Cindy came home and we ran up to a young neighbor couple who have too many cucumbers, if that is possible! Drove Chance and Hopes new outfit to see if it was burning oil. Seemed to do okay. When we got back I caught up Q Tip and worked her a bit in the round corral and then rode her down south. She is a sweetheart. Believe I will start calling her Q T cause she’s such a cutie. Got her fathers lope and her mothers no nonsense good nature, but all business. Damn, I am glad I have 2 full sisters to her. Now, to get them started! Oh, a buddy from Missouri called and offered me a good border collie pup, if we can arrange a ride for him. sounds like they are a ruff and tumble bunch with lots of grit. Maybe tuff like Bob but more biddable. Been working on a new song and Rick gave me some good advice when he was here. I think it’s gonna work. She kind of stammered and stuttered that she didn’t and then Cindy laughed. So I walked around to the other side where three older ladies were leaving and again, in my best accent, told these ladies “that thy dinna sell kilts here!” in somewhat of a grumpy Scottish voice. Two of the ladies grinned and the third took me serious and suggest downtown at some store she told me the name of, they might! Nice opinion piece. I agree with the man. I am sick and tired of idiots who use the term “cowboy” as a derogatory term. If they knew any “real” cowboys, they’d know it is a compliment! We brought her car home and I drove her back in this morning and bought a few groceries and then came home. Been working on some broken planks in the corrals and got them patched up. Got one or two more in another spot and we should be all set to work cattle and ship this fall. Now I think it’s time for an AC cooled leather shop! Supposed to get up in the 90’s today. Not much breeze today, but they are calling for the wind to blow tomorrow. Cindy and I drove down to a Memorial service for the father of a friend, in Wall last night. Cindy hadn’t been there in awhile so she got to see some of her old working partners, from when she worked down there. On the way back, the car bumped and jumped, so I guess it’s time to run it over to the garage and jack it up and knock the dust off the insides of the rimes, which throws the wheels out of balance. As long as you stayed under 50 mph, it wasn’t bad. I suggested she could do that this morning, and then take it somewhere and have the rims cleaned out or she could drive my pickup and I’d do it. Seeing as my pickup is gone and her car is setting here, evidently she decided on the latter! And damn fine ones at that, stopped in and spent yesterday. they are heading on this morning. So far on their trip, Darrel told me they had gone over 8,000 miles. We looked at a bunch of their pictures on the computer, which they had not gotten to see other than on the small screen on the camera. Wow! They have been to and seen some cool, places and things. Many of the same places Cindy and I would go to when we can afford the time and travel. Chance and Hope and kids came out for supper to see them and we had a nice evening. I have another person who I have met thru’ the computer who is in this area working, who is going to come visit for a day, sounds like. 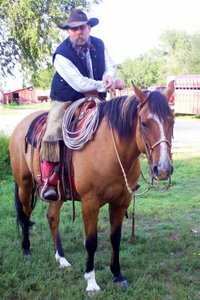 he is a member of the ranch board that I have linked on the side. If he can’t make it over, I will drive closer to the Hills area where he is at, and at least we will share a meal and some conversation. Then next week, another friend from the board, who I have visited with but never met face to face, is coming to stay for a week and spend some time here. Mike is a cool guy and I am looking forward to it. He will be here for the poetry gathering over at Devil’s Tower on the 4th. Several others from this wide area who are on the board are supposed to show up also. It’s so cool to get to shake hands with people you’ve only visited with on the interwebs! I ordered a wall tent yesterday. I’ve always wanted one and Chance and Hope need something like that so they can go camp on the river during the Artist Ride, so it seemed like a good thing to do with my tip money. Besides, me and Darrel are talking about an elk/deer hunting trip in the fall of 2013. He has a nephew who has been deployed to the sandbox on several tours of duty and Darrel would like to take him to the mountains on a hunt. Darrel and I would just go along to pack him in and enjoy the country and company. Darrel found a pack saddle and he is taking some of the rigging from mine to fix it up. We will also set up the tent for when we get larger groups of people stopping in. It is large enough to sleep quite a few and has a chimney hole, so I can build or get a small stove for it to warm it and even cook on. And Miss Kitty finally got around to having kittens this past week, while I was gone. some blood spots and Cindy was having a fit. Finally found a dead kitten yesterday and this kept up with more dead kittens as the evening proceeded. this morning she has one dead on and two live ones, which is plenty of kittens for anyone! Now, to convince her to raise them, outside! if you are involved with mountain lions, elk hunting deer hunting, or running cattle on private or public land. I’d like your thoughts on this one Corky. It gets better the further you go. Might want to just check out my comments to and from Jim, for a quicker read.